It's always interesting to see some unique form of cooperative play pop up, such as that which is coming in TweetDefense. 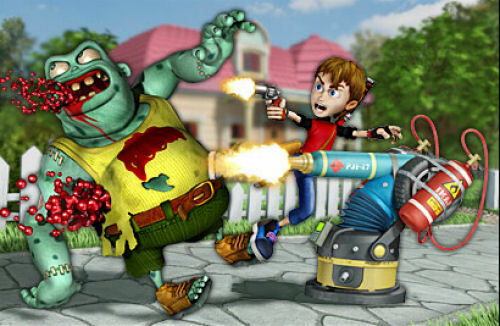 The iPhone and iPod Touch game mashes up zombie survival modes with the tower defense genre and throws in Twitter for good measure. Twitter? Yes THAT Twitter. Your power in the game is derived from your social networking numbers on Twitter; things like followers, tweets, and more. Using a secret mathematical formula the game will boost the power of your towers in the game to fight off one of the six different zombie types across ten levels. So the more friends you can acquire and cooperate with - the better your chances are for survival. The game is being produced by Promethium Marketing, which was founded by veterans of Microsoft's Gamerscore Blog. Being that there's a bit of a silly PR spin on the story. There's even viral marketing zombies to destroy. Die zombie die! *ok not really, but you should follow us anyway. Page created in 0.7578 seconds.